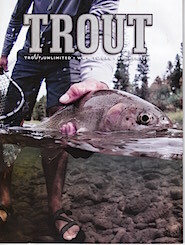 Look for my photography in the feature story highlighting TU's 20th Anniversary of the North Coast Coho Project in the Summer 2018 issue of TROUT. 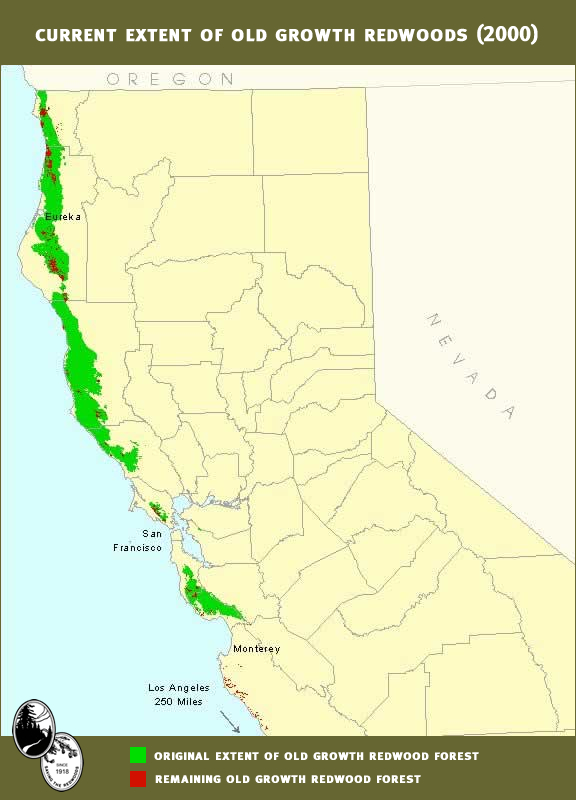 The article details Trout Unlimited's groundbreaking conservation partnership with a private timber company on California's North Coast enters its third decade restoring and protecting critical habitat for coho salmon and steelhead. In this feature story for Bay Nature I put down my flyrod (just for a while) and do some research. Driven by curiosity about the coho salmon that once lived and spawned in the streams of the Santa Cruz and San Mateo Coast, I begin a three year quest to find them. 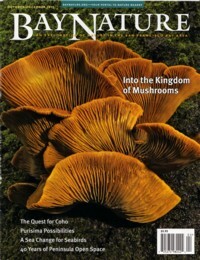 October - December 2012 issue of Bay Nature. Click on the image map to enlarge. 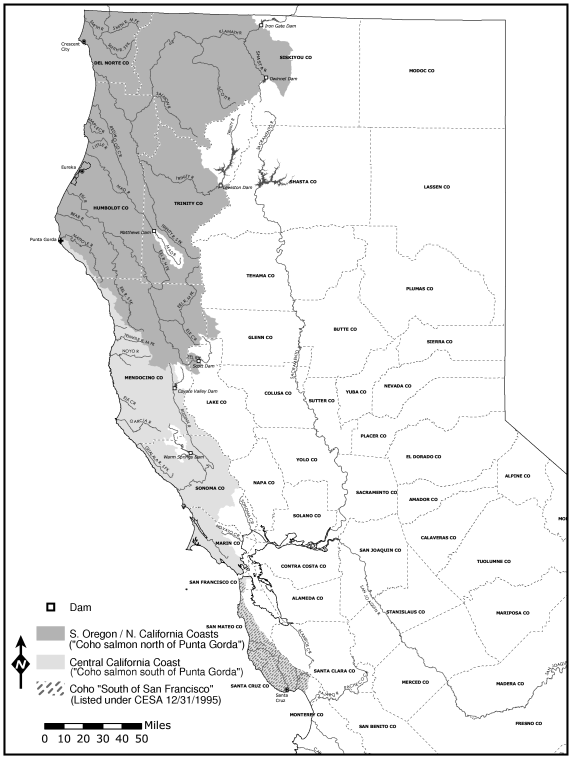 The map depicts the historic distribution of Coho salmon in California. D-r-o-u-g-h-t spells serious trouble for coho looking to spawn in Central California creeks. A series of postings on coho recovery efforts along California's North Coast. This series takes a behind the scenes look at how hatcheries are working to re-build lost runs of endangered coho salmon. 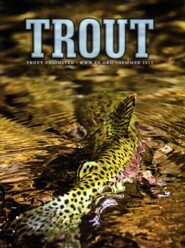 Look for my photography in the article Wine, Water, Fish, and People in the Summer 2013 issue of TROUT. The story puts a focus on the on-going effort to restore coho salmon on California's Russian River. As the Russian River flows through the heart of Wine Country it's an especially tough challenge. But as you'll read, the farmers and grape growers with help from groups like Trout Unlimited are looking for new ways to conserve water and restore critical spawning and rearing habitat for these endangered salmon. Today, fisheries biologists fear coho salmon have entered an extinction vortex along the Central Coast of California. Is extinction inevitable or can we recover their populations in time? 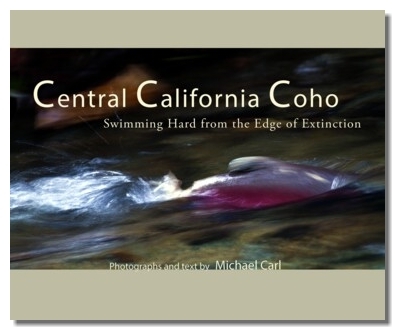 To understand both the challenges to their survival and the recovery efforts, writer and photographer, Michael Carl, travels up and down California's Central Coast exploring their natal streams, talking to scientists and fishermen, and working alongside fisheries managers at a conservation hatchery. In photographs and words this is their story. The ability for juvenile coho to survive California's summer of little to no rainfall and warm temperatures depends on their natal habitat. Not surprisingly, over-summer survival has been highest in stream habitat pool containing woody debris, and dense canopy cover. This higher quality coho habitat is usually found in the upper reaches of coastal streams not impacted by logging or tree removal. 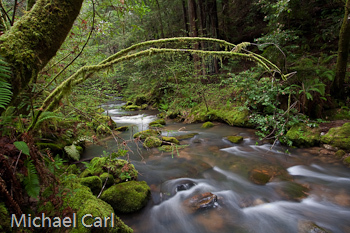 Is it any wonder that the best habitat remains close to the remaining stands of old growth redwood forest? It should also not come as a surprize that the watersheds suffering the greatest declines of coho happen to have the most resource extraction. Logging leads to lost of shade, woody debris, and ultimately far greater sediment loads. Listen to the podcast below, in which reporter Matthew Hansen interviews community members involved in the conservation of the coho salmon, including writer and photographer Michael Carl, as they explain why they work hard to preserve this ancient fish. Habitat requirements for successful spawning include suitable stream bottom substrate (gravel), water quality (temperature, dissolved oxygen, and sediment), water depth, and water velocity. 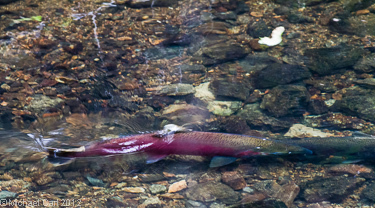 Coho salmon and steelhead trout (O. mykiss) require similar conditions of cool, flowing, well-oxygenated water, but differ in their specific needs. Spawning gravel size may range from fine gravel to coarse rubble, but the amount of fine sediment is important. A high percentage of fine sediment (silt and sand) is undesirable spawning habitat and may result in lethal conditions. Fine sediment reduces inter-gravel water flow, and may prevent adequate oxygen from reaching the embryos and removal of metabolic wastes. Female coho salmon will not spawn in gravels with excessive quantities of fine sediment (Sandercock 1991). Water quality is important for both spawning and egg survival. Salmonids require cool stream temperatures (less than 57°F), high oxygen levels (greater than 8.0 mg/L) and clean water (Spencer et al. 1996). Cool, moving water is often oxygen-rich water and provides the type of water quality for successful spawning and juvenile survival. The amount of water, which dictates water depth and water velocity, is also important to spawning success and egg survival. Females choose sites with appropriate water depth and velocity, but once spawning is complete, the developing embryos remain within the nest for a month or more. Appropriate water flow must continue after spawning; too much water may excavate the nest, while too little can reduce survivorship by raising water temperature and reducing oxygen flow. Based on recoveries of marked smolts and coded-wire tags, oceanic migration patterns of adult coho salmon along the North American Pacific coast indicate that coho salmon remain closer to their river of origin than do chinook salmon, but may travel several hundred kilometers (Wright 1968). A major factor in population cohesiveness is the fidelity with which adult salmon are able to home to their natal streams. Although ocean homing mechanisms are poorly understood, it is believed that high seas navigation is innately controlled and that the role of extrinsic environmental factors increases in importance as the salmon approach their natal estuary (Hasler and Wisby 1951; Brannon 1981; Hasler and Scholz 1983). Data from other river systems indicate that the timing of spawning migrations are generally attributed to the increase of stormflow runoff (usually occurring earlier in the northern range of coho salmon populations), which allows the salmon to migrate through the lagoons/estuaries and higher up the river systems to their natal tributaries. Since the earlier studies of the 1930's and 1940's, there has been an apparent shift in peak spawning migration timing within Scott and Waddell Creeks to several weeks later in the season. 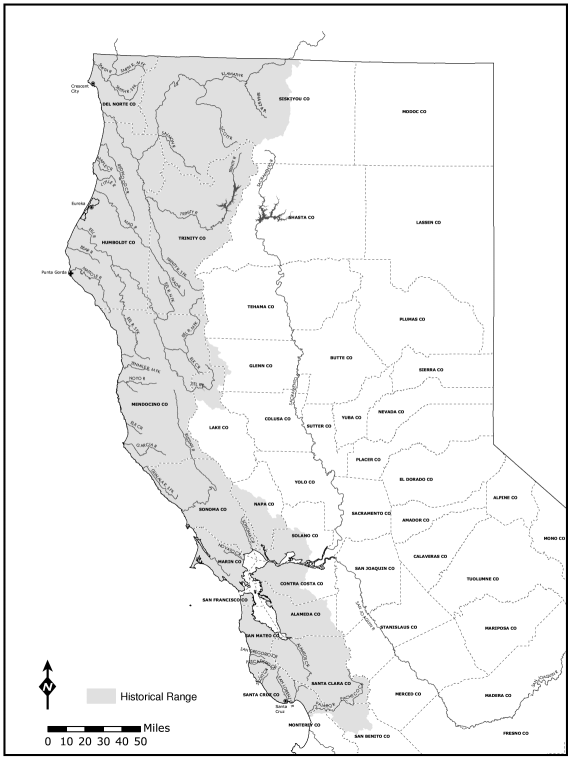 Spawning migrations in most California coastal streams and rivers have shifted to later in the spawning season, possibly due to degraded conditions within the watersheds, rivers and estuaries.